This Monday, the nation celebrates Martin Luther King, Jr. Day. If he hadn’t been murdered, he would be 89 years old. How would Dr. King view today’s activists? Would he join them to walk picket lines for a higher minimum wage, or take a knee as the national anthem is played? There are certain things in our nation and in the world (about) which I am proud to be maladjusted… I say very honestly that I never intend to become adjusted to segregation and discrimination. I never intend to become adjusted to religious bigotry. I never intend to adjust myself to economic conditions that will take necessities from the many to give luxuries to the few. I never intend to adjust myself to the madness of militarism, to self-defeating effects of physical violence. In other words, Dr. King was a radical. A few years ago, invocations of Dr. King’s radical spirit were hard to find. They’re more common today, but even the best-intentioned of these pieces tend to place his radicalism in the past tense. That’s a mistake. Dr. King is gone, but his ideals live on. We can never be sure how Dr. King might view current events, but he can still guide us through his rich record of words and deeds. Here are six ways that the revolutionary spirit of Dr. King lives on. Nonviolent direct action seeks to create such a crisis and foster such a tension that a community which has constantly refused to negotiate is forced to confront the issue. It seeks so to dramatize the issue that it can no longer be ignored … there is a type of constructive, nonviolent tension which is necessary for growth. Dr. King’s spirit lives on in the NFL protests and in Black Lives Matter. Some politicians who invoke Dr. King this holiday will try to reduce his memory to an emoji they can paste onto their platitudes. 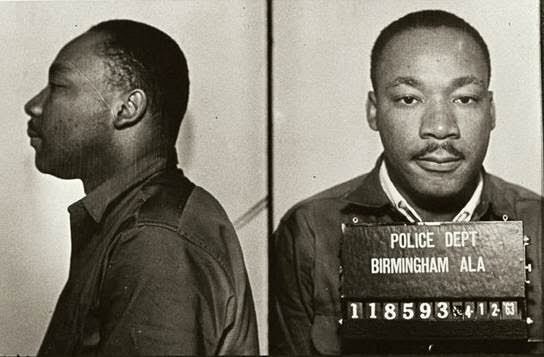 But Dr. King was a troublemaker, in the best sense of the word. He knew what it meant to create tension, and discomfort, and disharmony. While he lived, Dr. King was the target of almost unimaginable hatred and condemnation. It rained down on him from the streets of Southern towns and the corridors of FBI headquarters, from the boardrooms of bus companies and the booths of Boston diners. Dr. King preached communication, but experienced excommunication – from that cozy world of ‘insiders’ who may argue but will never risk their lives or careers for higher ideals. The attacks on BLM protesters and the blackballing of Colin Kaepernick would feel very familiar to Dr. King and his associates. It’s impossible to believe he would not see their struggle as his own. King’s spirit also lives on in the movement for economic justice. A 2014 Princeton study which has since been validated confirms that the United States has become an oligarchy, for all intents and purposes. Multinational corporations are dictating the rules of employment and trade. The ultra-rich accumulate more and more of our national wealth and income, as the middle class dies and 40 million Americans – including one out of every five children – lives in poverty. Corporations seek to inoculate themselves from being held accountable by promoting what they call “corporate social responsibility.” A few people may be helped, but these programs are little more than coins flung at beggars. Dr. King would probably not be impressed. He would probably see more of himself in the work of groups like FED UP who are fighting for economic justice. The provenance of this quote was questioned for years, until attorney and editor Amanda Moore tracked it down and confirmed it. Dr. King said it less than a year after Medicare was passed into law. Given what we know of his values, is it unreasonable to believe that Dr. King would stand with those groups that are fighting to ensure that Medicare’s protections are available to every American? And can there be any doubt that he would be committed to expanding Social Security, ensuring decent vacation and family leave benefits for all workers, and taking other steps to expand the social safety net? Dr. King’s spirit lives on in the most progressive and transformative elements of the labor movement. He understood that inequality, “the glaring contrast of poverty and wealth,” could not be defeated without organized labor. Dr. King didn’t hesitate to challenge the labor movement when unions practiced racial discrimination. But he was a fierce advocate for labor rights. He was in Memphis on behalf of striking sanitation workers, in fact, on that terrible night when bullets took his life. His spirit lives in the groups fighting to end our country’s campaign of permanent war, and in the brave men and women who work to end the illegal and immoral practices of our military and intelligence services. He undoubtedly would have opposed the extrajudicial drone killings ordered by our current president and his two predecessors, and the torture campaigns orchestrated by the CIA. Congress appropriates military funds with alacrity and generosity. It appropriates poverty funds with miserliness and grudging reluctance. The government is emotionally committed to the war. It is emotionally hostile to the needs of the poor. The original Campaign had a highly progressive economic agenda. It called for $30 billion to be spent every year on anti-poverty programs. That would amount to roughly $213 billion per year in today’s dollars, or $2.13 trillion over a ten-year period. That may sound astronomical, but it’s not much more than Congress just gave away in tax breaks skewed toward the rich. King’s Campaign was scheduled to begin with the construction a shantytown on the national Mall in Washington, DC, followed by a civil disobedience and mass arrests, and concluding with a nationwide boycott of major corporations and shopping areas to pressure business leaders to support its goals. The original Poor People’s Campaign also called for a program of guaranteed employment and guaranteed income for all Americans, as well as the construction of 500,000 low-cost housing units each year until all slums were eliminated. Jobs, income and housing for all. King’s vision is as radical and urgent today as it was fifty years ago. A society dominated by the wealthy, one that has given so much to the few for so long, can surely do this much for the many. Dr. King’s spirit lives on in the new Poor People’s Campaign, and in every place radicals gather to change the world.